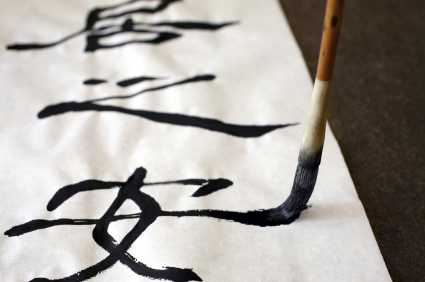 Chinese writing characters go back more than 3,000 years. The symbols began as pictures. Pictures were drawn to resemble the items they represented. A standard set of characters to be used throughout the Middle Kingdom emerged in 221 B.C. when China was unified for the first time, and the first Emperor Qin, issued that the same symbols should be used by all. 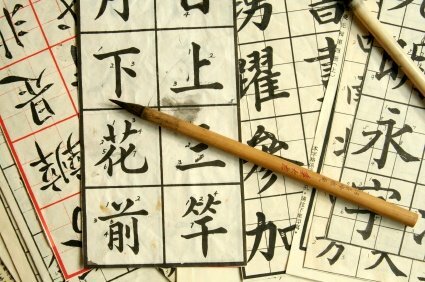 In ancient China, students had to memorize many pictures or characters each week and used brushes and ink to paint the "words". Chinese character writing is done in columns, from top to bottom and from right to left. So you start writing in the upper right-hand corner of the page. Characters for Chinese New Year Banners: Make your own Good Luck Messages for the New Year! Learn to write the Numbers in Chinese. This is a great introduction for kids and yes, it does come with 1000 words. It is a picture book with labels in simplified Chinese (used throughout Mainland China) and pin yin, and to learn the pronounciation, the internet resource comes very handy. Things and activities are featured, kids get to learn some basic words about things at home, in the kitchen, in the city, the park, the kindergarten, the farm, etc. Ages: Preschoolers to Age 12. Includes 64 flash cards, Audio CD, booklet guide and poster. Exactly what flash cards should be, fun and easy to use! Pictures are attractive and come with the writing diagrams in the back, which are easy to follow. This is a fun way for kids to learn their first words in Chinese: colors, fruits, animals, clothes, etc. It picks up where Chinese for Kids Flash Cards Volume 1 left off. It builds on what you already learned with more everyday easy words and phrases. This volume includes nature, opposites, going places, etc.